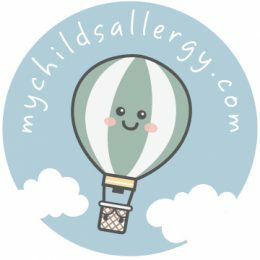 It’s that time of year again (how is that even possible) so I thought I would put together a list of some of the best allergy friendly advent calendars I have found. 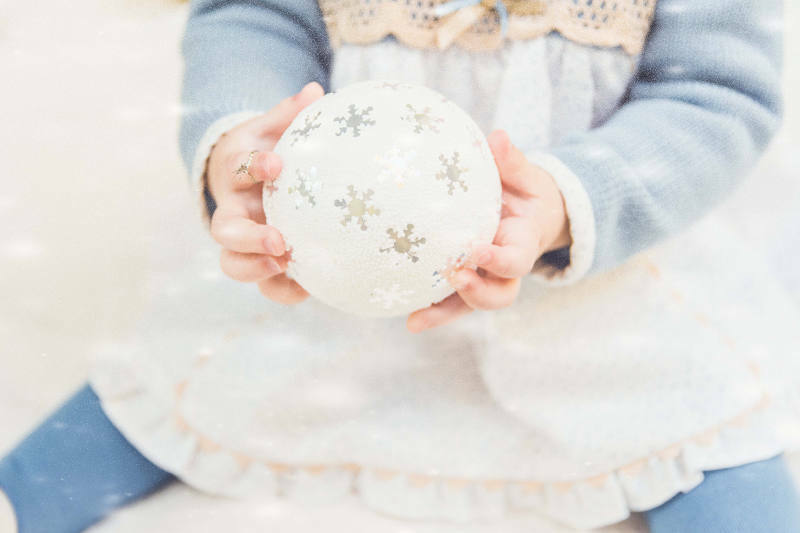 There are lots of options out there and no reason why our little ones with food allergies and intolerances should miss out on all the festive advent fun. My kids love Moo Free chocolate and it is one of the first allergy friendly brands I came across. Each advent calendar is made in their UK factory which doesn’t manufacture milk chocolate or any other milk based products. Their dairy free chocolate is made using a combination of natural, organic and ethically sourced ingredients. Ingredient list: Cocoa* [45%] (cocoa butter, cocoa mass), sugar* [35%], rice powder* [20%], emulsifier (sunflower lecithin) & natural flavouring. *Organic ingredients. 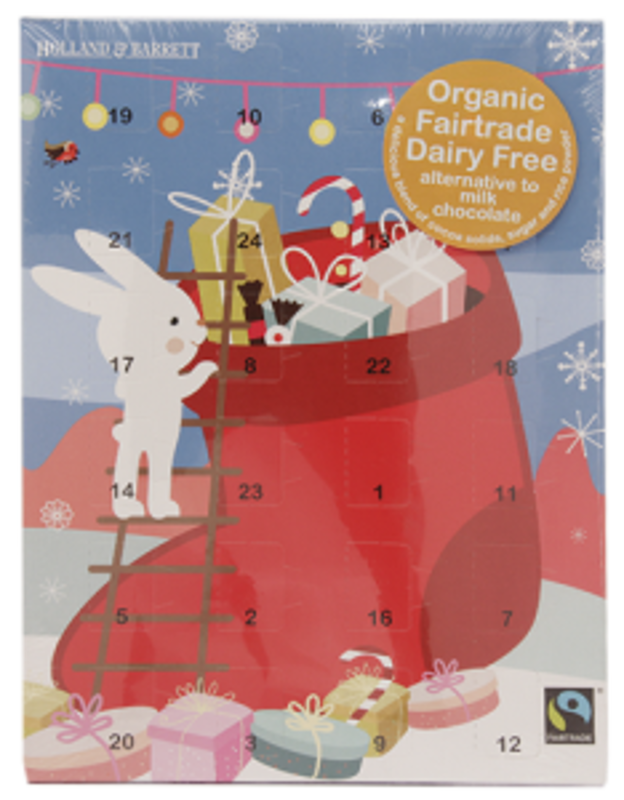 This organic dairy free milk chocolate alternative calendar is made in their own factory which never uses dairy or gluten. Available by the calendar or in a case of six. This calendar contains their best selling house blend of Organic Dark Chocolate but in a more child friendly box with slightly less chocolate per day. 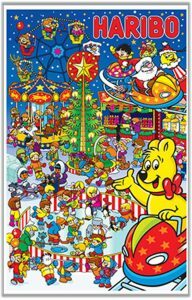 This colourful Christmas themed advent calendar even has a gorgeous picture to colour in on the back of the box, so it’s fun even after the chocolate has all gone! Ingredient list: Organic Dark Chocolate (Organic Cocoa Solids (73%), Organic Sugar and Organic Vanilla). Allergy advice: Vegetarian. may contain traces of nuts, peanuts & sesame seeds. Organically grown free from gluten, soya, preservatives, colourings and GM. 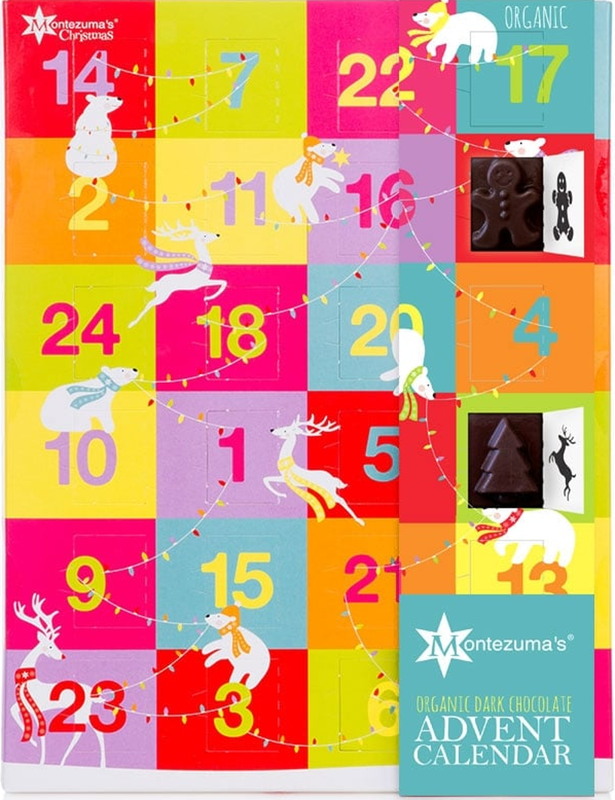 The Holland & Barrett Chocolate Advent Calendar is filled with 24, organic and dairy-free chocolates. perfect for vegans and those with lactose intolerances; just don’t eat them all at once! Ingredient list: Cane Sugar (35%) Cocoa Butter, Rice Powder (rice syrup powder, rich starch, rice flour) Cocoa Mass, Emulsifier- Sunflower Lecithin. Allergy advice: May contain traces of Soya. Organic, certified Fairtrade, dairy free, vegan friendly. 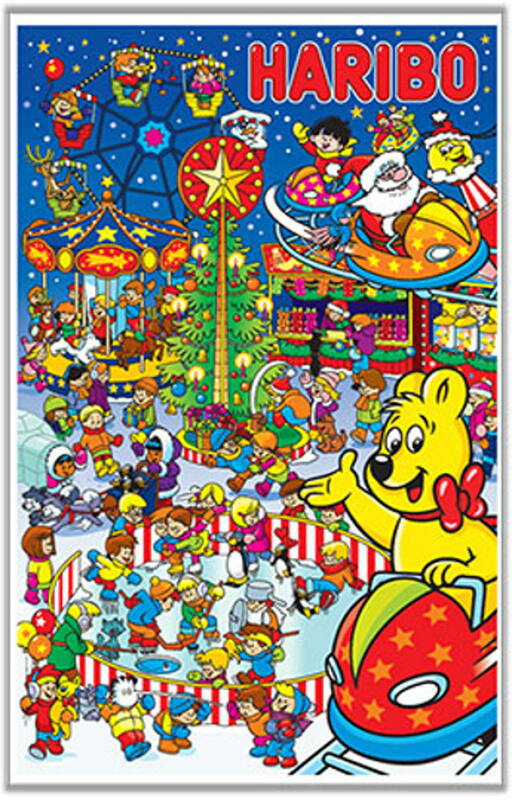 This Haribo advent calender contains a mixture of fruit and cola flavour chewy sweets, marshmallows, liquorices and gums. Cute and colourful packaging and varied Haribo treats each day. Kids will love this and I always feel my kids are safe when the Haribos are around. Allergy advice: Contain gluten. Not suitable for vegans as the sweets contain gelatine. 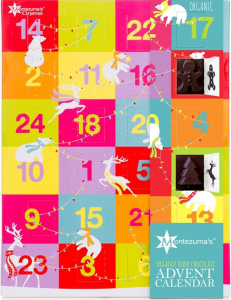 This isn’t an advent calendar but a great alternative! It has five festive flavours and a bonus bag with all 36 amazing flavours. 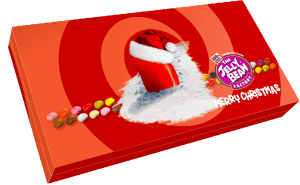 You can even include your own personalised message on the box. Ingredient list: sugar, glucose syrup, maize starch, water, fruit juice from concentrate (apple, orange, pineapple), acids (malic acid, citric acid, fumaric acid), glazing agents (shellac, beeswax, carnauba wax), natural flavourings, acidity regulator (sodium citrate), colours (anthocyanin, titanium dioxide, copper complexes of chlorophyllins, calcium carbonate, curcumin, vegetable carbon, mixed carotenes, paprika extract, lutein, chlorophyll), caramelised sugar, concentrate of spirulina. 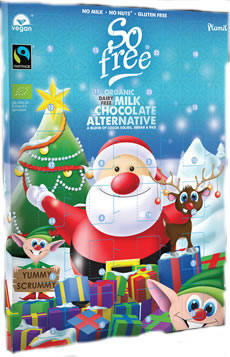 The supermarkets all do their own free from advent calendars too. Find them in the free from aisle.